Kosher slaughter is supposed to be kinder and faster than other slaughtering methods. The knife used to cut animals' throats is supposed to be so sharp, they barely feel the cut. Done properly, says the head of the Israeli Rabbinate’s international shehita (slaughtering) supervision department, Rabbi Ezra Raful, the animal should lose consciousness 30 seconds after both major blood vessels are simultaneously severed, immediately cutting off blood to the brain. 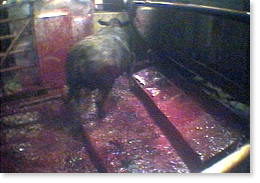 However, in 2004, a PETA undercover videotape of slaughtering practices at AgriProcessors – an Iowa slaughterhouse that is the largest producer of glatt kosher meat (the highest standard of kosher) and the only plant allowed to export kosher meat to Israel – showed a very different picture. 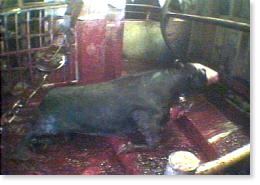 A ritual slaughterer is seen slitting the throats of steers placed individually in a rotating drum, after which another man rips open each animal’s neck with a hook. The pen continues to rotate and the animal, its windpipe hanging out, is dumped on the floor, but continues to move and slowly and shakily manages to stand. Rabbi Raful said the animal was not slaughtered properly because one of the jugular veins was not cut, so blood continued to flow. Although the steers on the tape appear to have been killed correctly by the slaughterer, he said, his rabbinate preferred that no one else cut the body until it had bled out, to avoid the perception that someone else participated in the killing. If the scenes on the tape are standard practice, AgriProcessors’ meat will no longer be accepted by Israel, he assured. 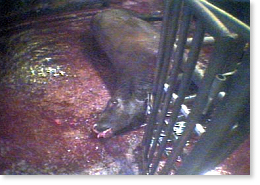 Rabbi Tzvi Hersh Weinreb, the executive vice president of the Orthodox Union, which certifies more than 600,000 products around the world as kosher, said the footage, though unpleasant, did not prove the slaughterhouse is violating shehita law. He said, however, that he would ask the plant to stop letting workers tear out the trachea and esophagus from the animals, and he is also considering asking that animals be held longer inside the rotating drum after their throats are slit. PETA filed a complaint with the U.S. Agriculture Department, alleging cruelty to animals. UPDATE: In a May 2008 immigration raid at the AgriProcessors slaughterhouse in Iowa, Immigration and Customs Enforcement officials arrested nearly 400 people. It was the largest raid of its kind in U.S. history. Because of this event, attention once again focused on the numerous violations of which AgriProcessors has been found guilty. An article in an Iowa newspaper, the Des Moines Register, lists the violations in the preceding two years relating to food safety, pollution, and workplace safety in the beef and chicken areas. "Many cows were still alive and conscious when they came out of the tube and were slammed onto the floor. Their heads often hit the concrete with a sickening crack. I watched as one cow landed on his feet and started scrambling around with a shocked look on his face. The workers simply jumped behind their barricade and waited for him to collapse." "A cow stood up after being dumped on the floor and went into the corner. They managed to kill one or two more cows while he lay there moving around trying to stand up. He continually moved his nearly severed head around … as his legs were also making an effort to stand." "The first time I saw a cow stagger to his feet and walk around with his trachea dangling outside of his body, I thought to myself, this can’t be happening—but after several days I knew better....There is no justification for the cruelty I documented in that slaughterhouse. The presence of the USDA didn’t have any effect, nor did the presence of the rabbis. These animals were failed by both religion and regulations." ‘‘The slaughter of an animal is not a pretty sight. It involves a lot of blood. But it would be a mistake to confuse aesthetics with cruelty." Watch PETA's five-minute video of slaughtered cattle struggling to survive. Meat from the AgriProcessors plant can end up in any market or restaurant. Because Jewish law requires that the sciatic nerves and certain fats be cut out, which tears up the meat until it can only be sold as hamburger, the hindquarters of virtually all kosher-killed steers are sold as conventional meat. Please consider that every single person who eats meat contributes to the horror revealed in the exposé of this particular slaughterhouse. 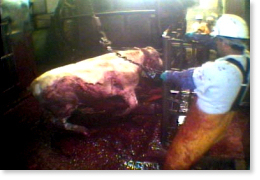 Suffering such as this is standard in slaughterhouses today, kosher or otherwise; it is not the exception.